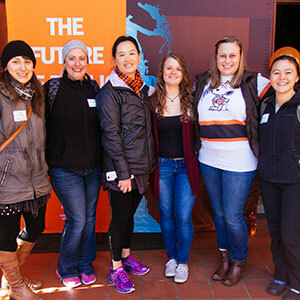 Healthy tailgating may sound like an oxymoron, but nutrition experts in the College of Public Health and Human Sciences proved it’s not by encouraging healthy tailgating options at the Nov. 21 football game against Washington. 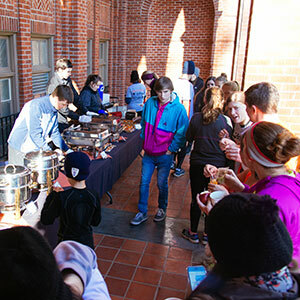 At the third annual GridIron Chef Contest and Beaver Bowl Fun Run, tailgaters got the opportunity to lace up their shoes and exercise at the annual 5K fun run and 1K for kids, then taste some healthy treats before the big game. Hosted by the Moore Family Center for Whole Grain Foods, Nutrition and Preventive Health, this year’s GridIron Chef Contest was bigger and better than ever – with about 30 recipes submitted and more than 100 tailgaters stopping by the Women’s Building to taste and vote on their favorite recipe from the contest. Allison Zumwalt of Portland was crowned the 2015 GridIron Chef with her recipe “Benny’s Butternut Squash Bruschetta.” Allison earned a pair of football tickets, and her recipe was featured at the CPHHS/PacificSource tailgater in front of Reser Stadium prior to the game where more than 1,000 samples were handed out to Beaver and Husky fans alike. Top-five GridIron Chef Contest winners with Moore Family Center Director Emily Ho (third from left). Each top-five winner received Bob’s Red Mill gift cards and a gift basket, in addition to their recipes being featured at the event. The Beaver Bowl 5k Fun Run and 1K for kids attracted nearly 100 participants who ran the course around campus while navigating through obstacles including a tire run, agility drills and more. Top runners received Garmin GPS watches and best team spirit winners will receive tickets to an OSU basketball game. Additional drawing prizes included a signed football and beaver apparel. GridIron Chef Contest sponsors included the college’s Moore Family Center, PacificSource and Bob’s Red Mill. University Housing and Dining Services supported the event. Beaver Bowl Fun Run sponsors included Be Well, Body of Health Chiropractic and Wellness Center, and Woodstock’s Pizza Parlor. In kind donations include PINTS Brewing Company and Tried & True Coffee Company. 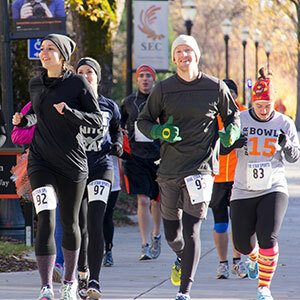 All proceeds from the run benefit the college’s Faculty Staff Fitness and KidSpirit programs. Be sure to check back next year to participate in the GridIron Chef Contest and Beaver Bowl Fun Run. For more highlights, read this Corvallis Gazette-Times article and view the slideshow above.